Hello!! Have a card I made today for the new sketch from CAS(E) this Sketch. I thought the sketch was pretty nifty and would work well with some little Studio Calico wooden words that I had purchased a few months ago, but not found the right project for. I jazzed up the words a little bit by adding some paint using Ranger paint daubers that I had in my stash (light pink, light blue and light green). I partially embossed a piece of rustic white card stock using my SU! Honeycomb embossing folder and trimmed it down to fit the card front, the edges were roughed up a bit and attached to the card base. I embossed another piece of rustic white with my SU! Woodgrain embossing folder and daubed on some of the paint. Once it was dry I punched out a butterfly and added a tiny kraft colored button. I arranged the words, added the butterfly and I was done. Supplies: Card stock: PTI Rustic White & kraft; words: Studio Calico; Paint Daubers: Ranger; Butterfly Punch: Martha Stewart; Button: PTI; Embossing Folders: Stampin Up! Hello friends!! Back with my second post for today. I haven't posted twice in one day in ages. Not something I generally like to do, but since the end of the month is rapidly approaching and with it the end of the Craft's Meow February sketch challenge I wanted to get my card posted to the challenge as soon as I could. Yesterday (Monday) I got happy mail in the form of three stamp sets from the Craft's Meow (along with some stamps and dies from another company). I have used two of those TCM sets for my card... Happy as a Lark and Lark Additions. 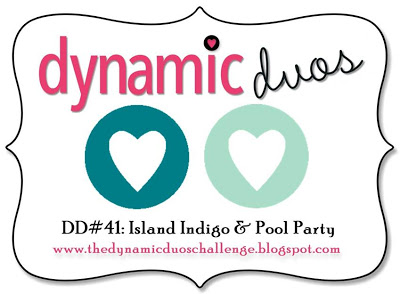 The color story comes from the current Dynamic Duo of Island Indigo and Pool Party. I don't have Island Indigo, but I discovered that Close to My Heart's Twilight is a very close match... yay!! Card pretty much explains itself... stamped the woodgrain image using Pool Party, trimmed it out and roughed up the edges. Stamped the bird using Twilight and trimmed it out. Embossed the background using my SU! honeycomb embossing folder and then roughed up the edges. The banners were cut from Pool Party and Island Indigo card stocks with my MFT Fishtail Flag Layers Stax dies and the edges roughed up. 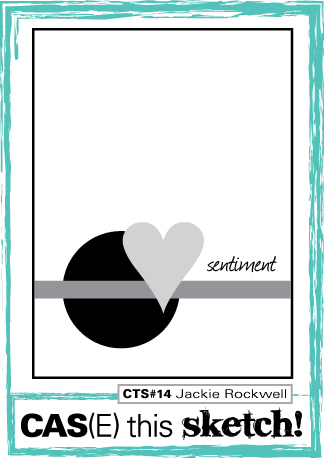 Sentiment was stamped using black ink and then everything was layered up. Easy peasy!! Hello friends!! Tuesday is here and that means time for a brand new CASology challenge! There were lots of fabulous entries for last week's challenge and with the cue word being "circle" this week I know that there are going to even more fabulous entries!! All the details can be found here. This week our guest designer is the very talanted Kim! Make sure to leave her some love!! I have to say that is this probably one of the few times I knew immediately what I was going to do when it came to my dt card. One of my very first stamping purchases was this really fun stamp from Hero Arts called Large Artsy Circles. 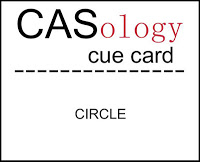 It is a border-type stamp which are pretty useful when it comes to creating a CAS style card. Simply stamp the border, add a sentiment and you are done. I stamped the image in a color I don't use alot when it comes to papercrafting: orange. I then added some rhinestones and the sentiment (also Hero Arts) which I thought was rather appropriate given that I had used the rhinestones. 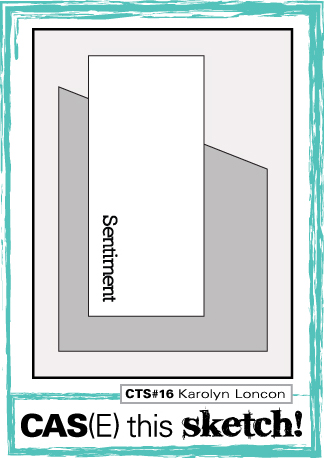 I rounded two corners for additional interest. Thanks for stopping by.... make sure you check out the cards from the rest of the design team: Melissa, Tracey, Jen, Ardyth, Judy, Maureen, Meghan and this week's guest designer, Kim. Can't wait to see what you come up with using this week's cue word! Hello friends!! Happy Saturday!! Got a bit of time in this morning to make a card for several challenges: Less is More (paper piercing), ColourQ (color combo) & CAS(E) this Sketch. But before I get to my card I have a little request. I have been participating in a contest over at the Practical Scrapper blog and I have made it to the top ten!! I would love to make it to the top five and that is where my request comes in... please check out the entries here and if you like my card I would be thrilled if you voted for me!! Thanks!! Now... my card. I used a favorite Hero Arts stamp Hydrangea and stamped it twice. Once in Always Artichoke and once in Cherry Cobbler. I then trimmed out the entired Always Artichoke image and the flower portion of the Cherry Cobbler image. The two were then layered. A piece of kraft cardstock was trimmed to correspond with the sketch and then I pierced the piece using a ruler. I kept the piercing simple because paper piercing isn't something I do a lot of and when I do I always seem to mess it up! The piece was then adhered to the card base, the sentiment stamped (also from Hero Arts) and then the image adhered using foam dimensionals. A few rhinestones finished things off... Pretty darn simple, except for all the fussy cutting!! Supplies: Cardstock: PTI white; SU! Crumb Cake; Ink: SU! 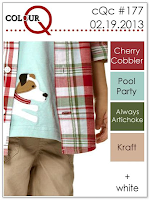 Pool Party, Always Artichoke & Cherry Cobbler; Stamps: Hero Arts; Rhinestones: SU! Hello friends! Wow... the week sure is speeding by... the weekend is almost here! Haven't done a ton of crafting, but I did get a little card made for the current My Favorite Things Guest Designer contest (MFTGUESTDT0313). And I managed to get it done a least a week and a half before the contest ends... YAY!! For this card I got out a newer PI called Warm Wishes and did some coloring with my Copics. Even though winter is almost over I really wanted to make something using this cute PI and the contest was the perfect venue!! 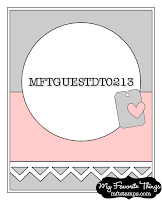 I'm really enjoying participating in the guest designer contest because it is giving me the opportunity to use my MFT products and it is pushing me to be a better paper crafter. I had intended to do some paper piecing on her as well... but as I spent the time trying to get a close color match to the papers I had chosen to use (The Scrap Cake's Cozy Xmas) I decided that I was having too much fun coloring the image to do any paper piecing. And can I just say that I am really, really happy with my coloring?? I think I'm finally getting the hang of coloring with my Copics, lol!! I used the following Copics to color the image: E11, E15, E21, E33, E50, E51, E53, R22, BG0000, BG11, & BG13. After I finished coloring her I trimmed her out and added a bit of Ranger Old Paper Distress ink to the image. The snowflake was die cut using a snowflake from the MFT set Let It Snowflake and the banner was cut using a Fishtail Flag Stax die. The edges of all the cardstock and patterned paper were distressed to give the card a bit of a shabby look. My picture doesn't really do her justice. It is gloomy here in western Washington and I think it took me longer to get a decent picture of the card than it did for me to make it!! Hello friends! Tuesday has rolled around, again, and that means time for a brand spankin' new CASology challenge and this week we have a real doosie for ya!! The cue word this week is "flame" and all the deets concerning the challenge can be found here. Our special guest designer this week is the very talented Bethany!!! Once, again, I struggled with this week's cue word. Don't it make ya feel good to know that even design team members struggle with the cue word??? Anywhoo... when I first saw the cue word the only thing that came to my simple mind was a campfire. Which would be fine except for one small thing... I have no campfire stamps. I was about to jump on the Google train to do some research when inspiration finally struck. I remembered that I had a Hero Arts set called "Birthday Candles"... perfect for the challenge! However the candles are on the large side so I knew that in order to keep things CAS I would need to use only one candle. I picked a candle and then stamped it in the center of my card base using yellow ink. The candle was then stamped again on patterned paper, trimmed out and popped up on the card base. I stamped the flame portion of the candle on white card stock and added two different colors of Stickles (Paprika and Buttercup), blending them together. Once dry I trimmed it out and popped it up on the card base. A banner was cut using a My Favorite Things Fishtail Flag Stax die, the sentiment stamped and then each end of the banner was scored and folded as you see and then attached. Thanks for stopping by.... make sure you check out the cards from the rest of the design team: Melissa, Tracey, Jen, Ardyth, Judy, Maureen, Meghan and this week's guest designer, Bethany. Can't wait to see what you come up with using this week's cue word! Hello friends! A quick post with my card for this week's Less is More challenge. The challenge this week is to make a card that has something that you find up in the air. I immediately thought of my new Hero Arts/Operation Write Home set: Happy Birthday. This set has a fun hot air balloon, a cloud as well as a balloon bouquet. I used the balloon bouquet and the cloud for my card. I stamped three clouds using pale blue ink and then the balloon bouquet using black ink. I then stamped the balloon bouquet on three diffrent papers from the BasicGrey Fiction 6x6 pad, trimmed them out and then paper pieced them. A banner was cut using a My Favorite Things Fishtail Flag Layers Stax die and the sentiment stamped on it. I trimmed the banner, adhered it to the card and then added a little button/twine embellishment. I seem to be stuck on making those little embellies right now! Hello friends... here with another little card I made. This time for the current CAS(e) this Sketch challenge. I kinda went a little funky with this one. It isn't exactly CAS and it isn't exactly shabby chic... but a little bit of both!! The little flourish is from the My Favorite Things Own Your Story set and the sentiment is from My Favorite Things January Triple Scoop set. I stamped the flourish using Close to My Heart's Barn Red and the sentiment in Memento Tuxedo Black. I wasn't going to use a banner on my card, but I just had to use the banner in my new Stampin Up!/Sizzix Framelits Hearts A Flutter dies. I cut the banner from corrigated paper and then swiped on some white ink. A strip of natural muslin was pleated and then adhered to the banner. A button/twine embellishment was then added and the banner adhered. I distressed the edges of the cardstock piece and curled two corners before adhering the piece to the card base. Like I said... it is kinda funky... but I like it! Thanks for stopping by and if you made it to the bottom of my post I have a little request to make of you. I have been competing in a card contest taking place at the Practical Scappers blog. This is the first time I have entered a contest like this and the first time I have made it as far as I have. I would love to make it to the top 10... oh heck who am I kidding??? I would love to win! But in order to make it to the top 10 I need your vote. So.. if you are interested in voting, please go here. Thanks!! 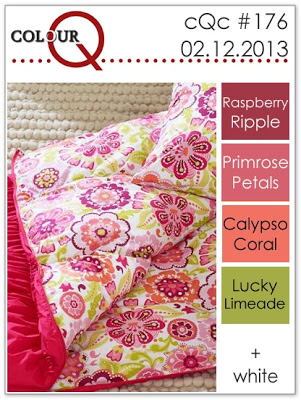 Hello friends... here with a card for the current ColourQ challenge. Normally I like to combine a couple of challenges when I make a card, but I really wanted to make a card using my new PTI set Fancy Folk Art. So, last night I finally got the chance and the mojo to make something. 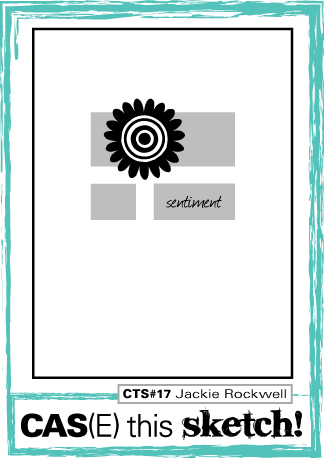 It is a very simple card since right now I'm definitely in the mood to make CAS style cards... my sweet bloggy friend, Sue, will probably laugh at what I just wrote if she reads this post because she knows I'm always in the mood to make CAS style cards! Anywhooo... it did take me a while to get the card completed because I took the time to make sure I had the right color combo on the floral image. Initally I tried to work all the colors into the image, but the Raspberry Ripple (I used Rich Razzleberry instead) color just looked completely out of place when I included it... so it ended up being used for the sentiment. The large floral image was die cut and then the stamped first with the outline leaf image in full strength Kiwi Kiss (no Lucky Limeade) and then the solild leaf image was added using the second generation method to make the outlike stand out more. The same thing was done to all the floral images, as well, and then all the flowers were adhered using foam dimensionals. The finished piece was then adhered using additional foam dimensionals and the sentiment added. Hello friends!! It is Tuesday and that means time for a brand spankin' new cue word!! And in honor of Valetine's day (which is two days from now!!) 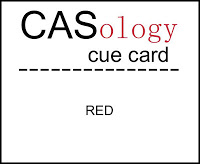 the cue word is "red". All the details can be found here. Our talented guest designer this week is Lucy. Make sure you stop by and leave her some love! We are also sponsored this week by 2CuteInk a super fun digi shop! With red being the cue word there were just so many ways I could take my card, but one thing I decided right away was that I was not going to use the same color red that I used last week!! This week I decided to use SU! 's Riding Hood Red and have it take a larger role by using it for my card base. I also decided to do a little bit of coloring with my Copics. I pulled out a Taylored Expressions petite stamp set called Spring Tulips and colored them with the following Copics: R20, R24, R27, R29, YG00, YG03. B0000 and B000. Once I was finished coloring the image I die cut it using a Spellbinders plain rectangle die. I wanted to have the image framed, but I didn't want to add any addition layers to my card so I embossed the next larger die onto my cardstock base and adhered the image using foam dimensionals. The embossed frame provides a nice, subtle detail to an otherwise somewhat plain card. 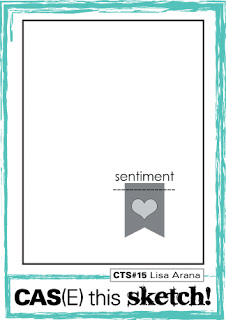 Finished things off by stamping the sentiment (also from Spring Tulips) directly on the card base with black ink. Thanks for stopping by.... make sure you check out the cards from the rest of the design team: Melissa, Tracey, Jen, Ardyth, Judy, Maureen, Meghan and this week's guest designer, Lucy. Can't wait to see what you come up with using this week's cue word! Hello friends! I have a little card to share. I actually made this several days ago, but haven't been able to post it until now. I used the current ColourQ colors, as well as the current sketch from CAS(e) This Sketch. This is my second attempt with the ColourQ combo. The first attempt didn't end as a complete disaster, but I wasn't at all happy with it and so decided to not bother posting it. The same cannot be said for this card because I absolutely love how it turned out!! The first card I made was sort of a more is more type of card and that was the problem. There was just way too much of certain colors from the combo. This is defintely a less is more card and as such makes me very happy! As I contemplated the CTS sketch I remembered that I had purchased some Washi Tape when I made my recent trip to Impress Rubber stamps and I thought some of that tape just might work for the color combo and Yay... it did!!! So I adhered a strip of the Washi tape to my panel. I then die cut the bird from the orange polka dot patterned paper and the leaf from pink pirouette. After arranging them I realized that something was missing so I ran the leaf through my woodgrain embossing folder to add some texture. But something was still missing... so I grabbed a dark red button and some dark pink bakers twine and created the little perch for my bird and it all fell into place. Once everything was adhered in place I stamped the sentiment from the Taylored Expressions set Make it Amazing. Hello friends!! Here with a card for the current Less is More challenge. This week is the dreaded one layer challenge. Thank goodness this time I double checked what the challenge was before starting my card. Last month I made a card the one layer challenge then realized that my card wasn't one layer as required!! As well as having the requirement that the card be one layer it needs to have a musical element on it. I don't often use masking on my cards, not sure why... I just don't. It is a rather simple technique that can result in some really stunning effects. I decided to do some simple masking by cutting a piece of Eclipse tape to fit my card front and then die cutting a heart in the center. Once I did that I placed the mask on the card front and stamped the front with the Hero Arts Musical Background cling stamp using grey ink. After I removed the mask I stamped the "me & you" from the HA clear set "You & Me" using red and black inks. Three little clear rhinestones finished things off. Thanks for stopping by.... On the Less is More front we got some sad new... Mandi, who founded LIM with Chrissie, has had to stepped down from her LIM post. Several months ago she purchased a wedding planning business and must devote all her time to growing that business. She will be sorely missed by everyone!! But there is some good news as the fabulously talented Jen will be continuing on as a designer for LIM! Supplies: Cardstock: PTI Rustic White; Stamps: Hero Arts; Inks: Memento Tuxedo Black, London Fog & Ladybug; Rhinestones: Stampin Up! Hello friends!! As many of you probably know, PTI is celebrating it's 6th anniversary and there have been some fun contests going on. I missed one of them and wanted to get a card made for today's contest which is to make a project using one of PTI's Year of Flowers sets. I have six of them and for the very first time (yep... very first time... so sad!) I inked up the YOF Larkspurs set. 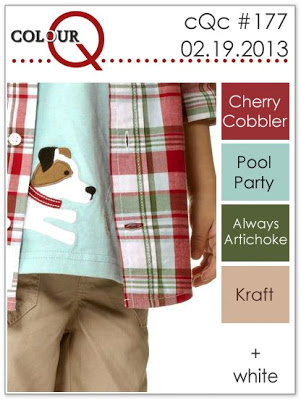 I used the color combo for this week's CAS Colours & Sketches Challenge. I have to say that I'm super excited about today's PTI announcement. PTI is now going to offer dies that match each of the YOF sets!!! I'm planning on picking up the ones that corresponde to the sets I have. Because I wanted to make sure I got the card done before 7:00 am est on Saturday I kept my card very simple. I stamped the image on Vintage Cream cardstock using Memento Tuxedo black and then colored it with Copic markers. Once I was done coloring the image I trimmed it to fit the card front as you see. 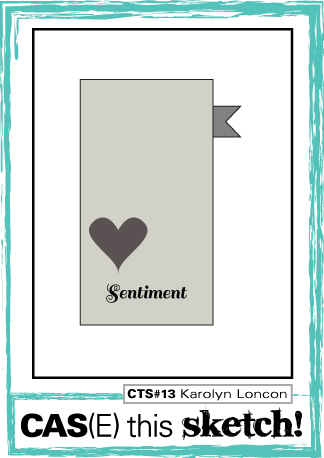 I then stamped the sentiment from the Larkspur set on Vintage Cream and die cut the fishtail banner using my MFT Fishtail Flag Stax dies. The banner was trimmed down and the corners rounded. I tied some kraft bakers twine through a Plum Pudding button and adhered it to the banner. Hello friends!! Tuesday is here and that means time for a new CASology challenge!! YAY!!! Yet, again, I was completely blown away by the creativity to be found in last week's challenge! There were so many clever takes on the cue word that time after time I found myself saying "doh! why didn't I think of that????" I know this week is going to be just as creative!! 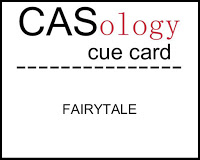 The cue word for this week is "fairytale" and all the details can be found here. 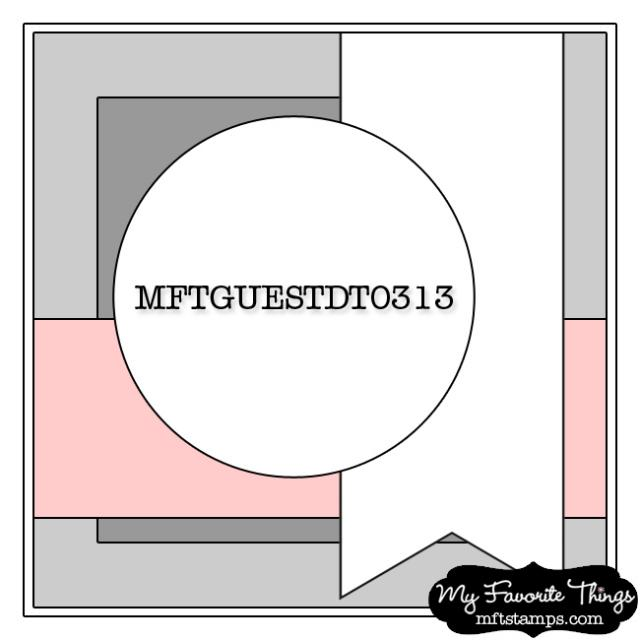 Our guest designer this week is none other than the super creative (as well as hiliariously funny... check out her blog!) Darnell!! Once, again, I had a hard time with this cue word trying to figure out the direction I wanted to go in with the cue word. So I hopped on the Google train and looked up some fairytales and found a couple of fairytales that I thought would work with my stamp collection. But honestly, I just couldn't come up with any good card ideas. Finally on Friday (as I was making a card for a completely different challenge) I remembered a fairytale that I had read as a child called Snow White and Rose Red (the fairytale can be found here if you want to read it). Yay!! I had an idea. Some of you have seen a version of my card on my blog before, but hey... if it ain't broke, don't fix it is what I say. The card base and the jumbo fishtail banner are PTI's Rustic White and the rose was made from SU! 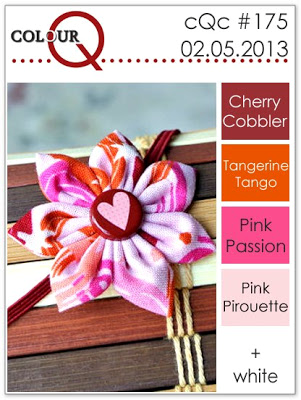 's Cherry Cobbler using the My Favorite Thing Mini Hybrid Heirloom dies. The images (from the SU! set Vintage Fresh & PTI's Pretty Peonies) were stamped using Cherry Cobbler ink, but stamped in different intensities to provide a bit of contrast. When using a bold color on a CAS design I sometimes like to vary the intensity so that there is that contrast. Thanks for stopping by.... make sure you check out the cards from the rest of the design team: Melissa, Tracey, Jen, Ardyth, Judy, Maureen, Meghan and this week's guest designer, Darnell. Can't wait to see what you come up with using this week's cue word! Hello friends... have another card to share. This one is for the new LIM challenge and for the current CAS(e) this Sketch challenge. Must pause for a moment and wish Chrissie, Mandi and Less is More a great big Happy Birthday!! LIM just turned two.. can't believe that Chrissie and Mandi have been putting forth a new challenge each week two years!! And in that time I have only missed I think two challenges. I missed the very first one because by the time I discovered LIM the challenge was closed and then I missed another for some reason that I don't remember. Anywhoo... here is to many more years of fun challenges with Less is More! The LIM challenge this week is to use kraft and cream (or kreme). Didn't have to ask me twice to make a card for that challenge as I love to combine kraft with just about any color. But there is something so very classic and elegant about kraft and cream. For my card I used a newly acquire Penny Black stamp called "dreamy", as well as a Penny Black sentiment "tiniest". I stamped the image using SU! 's Crumb Cake ink and then brushed on some Diamond Stickles. Unfortunately, you cannot see the Stickles in the photo. I rounded one corner of the piece and then rounded the corresponding corner on the card base. The sentiment was stamped using Memento Rich Cocoa ink to keep things monochromatic. I created the little butterfly embellishments by threading some twine through the buttons and trimming the ends as you see. The each button was adhered to a Studio Calico veneer butterfly and then adhered to the card. I wasn't going to add the third butterfly embellishment, but I decided to go with the "rule of 3" and add the third one. Hello friends!! 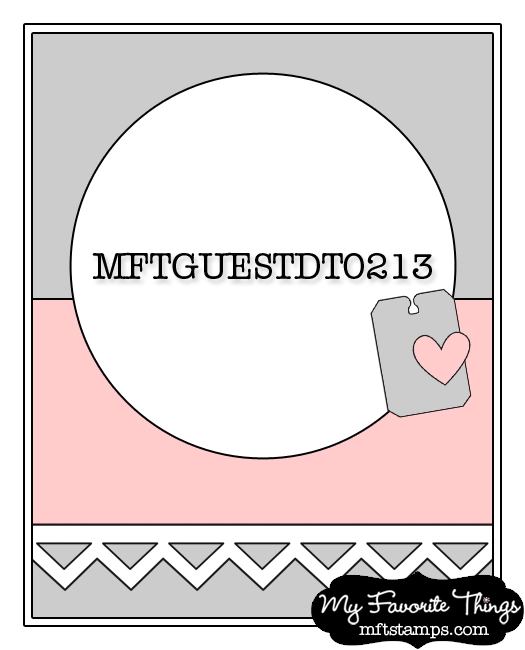 Have a little card I made for the current MFT guest designer contest in keeping with my goal to participate in all the guest designer contests this year. I love MFT products and participating in the challenges also gives me a good reason to use my MFT products!! The challenge this month (as in past months) is to create a project using a fun sketch. For my card I decided to use the super cute (well... all the PIs are super cute!) set Paper Dolls and the coordinating Paper Dolls border die. Part of the reason I'm participating in the contests is to improve certain skills... like my coloring skills. Usually when I work with a PI image I like to paper piece her clothes and then color her skin and hair with Copics, but this time I colored the entire image using Copics (RV32, RV34, G20, G21, E11, E15, E49 & E50). It took me several tries to find a fairly good color match to the polka dot paper behind the image. I also tried to find a good color match for the little paper dolls. Times like these makes me wish I had just a few more Copics... ha! Anyway after I got her colored I cut her out using a Spellbinders small plain circle die and then matted that with a circle cut from kraft cardstock using a Spellbinders large plain circle die. The papers are from the My Mind's Eye Sweetest Thing Lavendar collection. I made the rose using the recently released MFT Mini Hybrid Heirloom Rose die set. 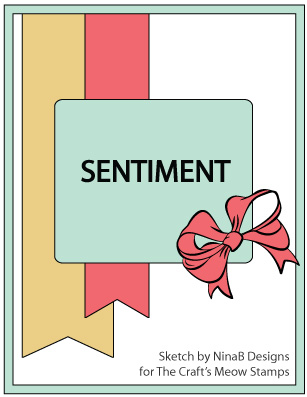 The inside of the card was finished off with some additional paper, another paper dolls border and a sentiment. 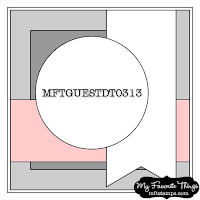 Make sure you stop by the MFT blog because the current release is in full swing and there are tons of super cute new stamps and dies being offered this month!